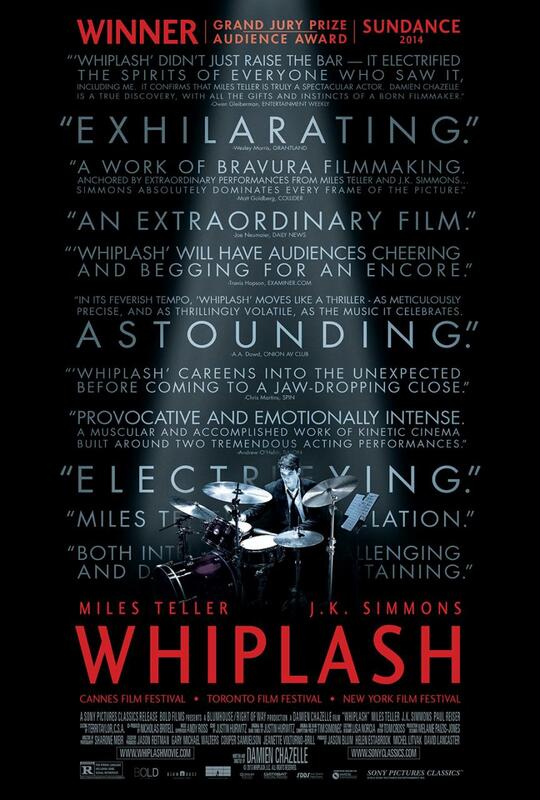 I enjoyed watching Whiplash over the weekend. This is a movie that will take you up to the edge and over the waterfall, if you know what I mean. While I enjoyed watching it more than I enjoyed Birdman, I think Birdman will have the edge during awards season. Here’s why: Whiplash takes a close look at just a few ideas, whereas (despite my criticisms of the film) Birdman takes a nuanced look at a lot of ideas and characters. Still, Whiplash is a joy to watch. Some say the movie is about teaching method, but I think the movie is about the music, talent, and art overcoming the process. And, this is evidenced in the way the film ends–paying homage to the music. The audience loses sight of the drama and the personal dynamics as the final performance plays out. And I loved that. I also really loved the relationship that Miles Teller’s character Andrew had with his father Paul Reiser. It was a minor aspect of the movie, but this was a highlight of the film for me. If the film had followed a more predictable narrative, the relationship between father and son would’ve been strained. The father would have either pushed the son too hard, or would have disapproved of the son’s pursuits all together. Instead, the film portrays a gentle, loving, and supportive relationship between father and son, and it results in a tenderness that I would love to see more of between two men on screen. There are a few really predictable aspects of the film, the most noteworthy being that Andrew very predictably sabotages his personal relationships for the sake of his success. There are a few uncharacteristic scenes as well. The character Andrew is a strong combination of deeply insecure, appearing to second guess himself at every turn, coupled with brief explosions of self-assuredness that are usually at the expense of this peers. There is an amusing scene where Andrew is having dinner with his father and extended family. It is clear that the family does not really understand or value what Andrew is doing, and Andrew broods silently before schooling them all. It’s amusing, but isn’t really indicative of the character throughout the rest of the film. Overall, I think the film might’ve been more powerful if Andrew was more aggressive, funny, fast-talking, and confident throughout the film, and only the teacher, Fletcher, played by J.K. Simmons, was able to destroy that confidence. Anyway, it would’ve given Fletcher’s character more convincing power throughout. Despite all that, I enjoyed the film, the music, watching the process. The whole thing inspired me to practice piano. Maybe that’s all. This entry was posted in art, film, keyboard, piano and tagged whiplash on January 14, 2015 by sherewin. I rush home to play the piano. (Well, keyboard.) I listen to songs on the radio and try to figure them out while driving. I fill out all of the exercises in my lesson book just for the joy of it. My mom’s pretty competent at the piano, but has always wanted to play the violin. She started taking lessons this summer and absolutely loved it. I, on the other hand, have always wanted to play the piano. I took lessons when I was very young, but they were short-lived. This summer, my mom inspired me with her violin lessons. She kept saying things like, “I just love it,” and “It’s so great.” It’s probably the English major in me, but I’m always prompting her to explain what she means. “What’s great about it?” She couldn’t quite explain. Now, neither can I.
I found a teacher who lives nearby and signed up for lessons this fall. I immediately loved it and, like my mom, find myself sort of inarticulate about it: “It’s the best thing ever,” and “It’s just so great.” At first I really loved the forced meditation. Music requires your entire brain, and when I’m concentrating, there is no room for chatter. There is no room for anything else, and it is divine. One of the things I miss from my last relationship is music. I miss singing (though I am shy!) and I miss hearing the new song and the song that’s dedicated to me. So, I’ve tried to create that for myself. I’ve been surprised by how quickly I’ve been able to move through the lesson book and how satisfying it is to play. 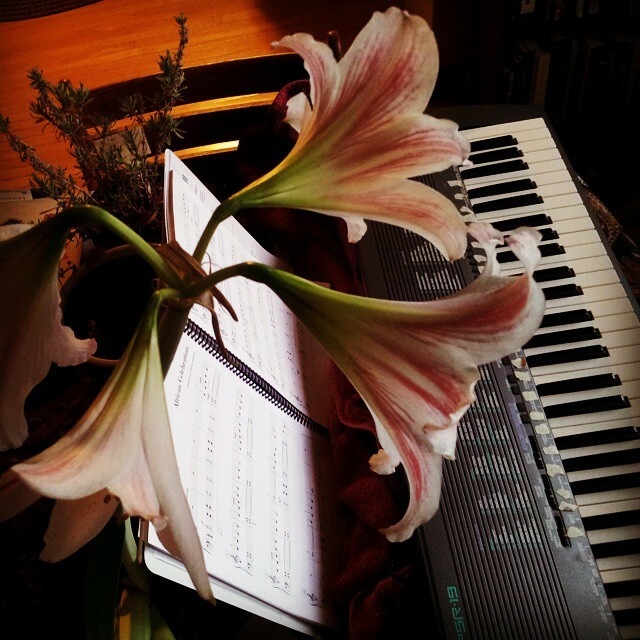 This entry was posted in art, enlightenment, family, keyboard, life, love and tagged piano lessons, violin lessons on December 14, 2014 by sherewin.